Irene is the Founder and Executive Director of Kidpower Teenpower Fullpower International, the internationally-recognized global nonprofit leader in ‘People Safety’ education, providing positive and practical solutions to bullying, violence, and abuse. Since 1989, Irene has inspired an international movement of leaders, reaching over 5 million people of all ages, abilities, identities, and walks of life with effective, culturally-competent interpersonal and social safety skills. Throughout Irene’s three decades of leadership and collaboration, Kidpower has earned an outstanding reputation for developing, organizing, and presenting high quality child protection, positive communication, advocacy, self-defense, and personal safety programs and curriculums that have delivered successful outcomes. She is a proven expert at adapting Kidpower’s services and programs to meet the needs of those facing increased risk of violence because of disabilities, poverty, and prejudice. As Kidpower’s expert lead author, Irene places time-tested life-saving skills and lessons directly into the hands of parents and professionals. 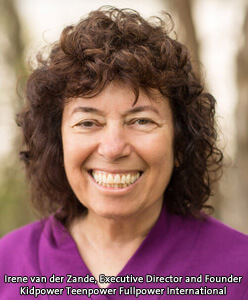 Her work has gained world-wide acclaim from experts in education, law enforcement, and health for being upbeat, experiential, age-appropriate, emotionally safe, trauma-informed, and relevant in today’s often-challenging times. Kidpower lessons have been presented in over 20 languages, across six continents. 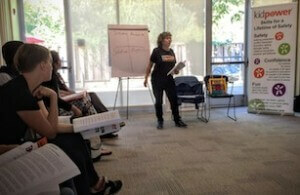 Kidpower trainings attract participants from around the globe. Irene is an inspiring, passionate, and entertaining speaker, trainer, and storyteller who is a master at preparing people to transform problems into successful practices; to take charge of their safety and well-being; and to develop joyful relationships that enrich their lives. Internationally-recognized personal safety expert on designing and implementing programs that help to protect kids, teens, and adults, including those with special needs, from bullying, abuse, harassment, domestic and relationship violence, assault, and abduction. Leader of the development of the effective and empowering curriculum, services, instructor training programs, and organization of Kidpower Teenpower Fullpower International. Instructor who has taught thousands of people of all ages and abilities how to take charge of their emotional and physical safety and well-being. Trainer of thousands of parents, educators, mental health professionals, health care providers, law enforcement experts, martial artists, community leaders, and social workers on how to use Kidpower’s “Turning Problems Into Practices” method in their professional activities, schools, families, and communities. Consultant, trainer, and mentor for a wide range of nonprofits, businesses, and professionals in organizational development, leadership, personal safety, and conflict resolution. Author of many books, articles, and educational resources on child development, parenting, personal safety, child protection, and self-defense. A dynamic and inspiring speaker known for making presentations experiential as well as informative by incorporating demonstrations and practices of skills tailored for her audiences’ specific needs. 1987 – 1,2,3…The Toddler Years, published by Toddler Center Press, 1987, used as an early childhood education textbook, sold over 40,000 copies. Foreword by Magda Gerber. 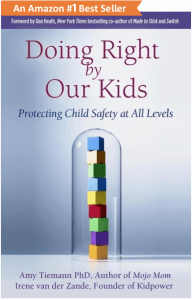 2018 – Doing Right by Our Kids: Protecting Child Safety at All Levels, co-written with Amy Tiemann, PhD., published by Spark Press. #1 Bestselling book on Child Safety, Parenting, and Adult Leadership in the #MeToo Era. Kidpower’s K-12 Safety Curriculum Teaching Books. See a complete listing of RelationSafe Books, by Irene.